In February 2016, a new collaboration was launched with local professional photographer Melanie Dreyer, of Aria Arts and Photography. Our idea was to merge the talents of both a photographer and artist, to create a Fine Art Experience. The collaboration was launched at the Kamloops Home show, where we met the wonderful Nimfa Valenzuela. Nimfa was looking for a way to celebrate her anniversary. During their wedding in 1996, they did not have a professional portfolio of images to commemorate the day, although they did have a friend take some great shots. After seeing Will painting live during the event, Nimfa immediately thought it was the perfect gift to surprise her husband with. After we sat down together and looked through the shots, we settled on an image. The original background was quite busy and Nimfa had a few requests to alter the original. We added a natural background and some tweaks to parts of the image. 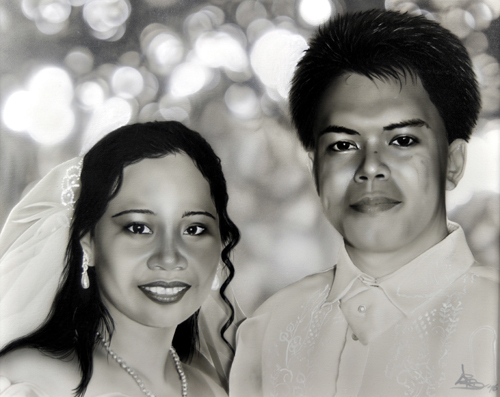 This painting is on a 16×20 Canvas, using airbrushed acrylics and hand detailing. The frame was supplied by Access Picture framing, Kamloops.